The Mediterranean Sea has become the deadliest stretch of water in the world for migrants and refugees, the United Nations High Commissioner for Refugees (UNHCR) reported today. According to the UN agency’s estimates for last year, more than 1,500 people drowned or went missing while attempting to cross the sea from Africa to reach Europe, making 2011 the deadliest year for this region since UNHCR began recording the statistics in 2006. “Our teams in Greece, Italy, Libya, and Malta, warn that the actual number of deaths at sea may be even higher,” UNHCR spokesperson Sybella Wilkes told reporters in Geneva. 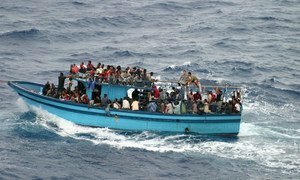 Ms. Wilkes added that the UNHCR estimates were based on interviews with migrants who reached Europe by boat, telephone and e-mail communication from their relatives, as well as reports from Libya and Tunisia from survivors whose boats either sank or were in distress. Since pro-democracy protests erupted across North Africa and the Middle East early last year, large numbers of people have taken to boats to try to reach Europe, with Italy and Malta bearing the brunt of the displacement and migration. Survivors have recounted harrowing stories of being forced onto unseaworthy vessels by armed guards, particularly during April and May in Libya. Some have even reported cases of abuse and torture experienced at the hands of other passengers during the journey. Ms. Wilkes noted that despite poor weather conditions and high seas, UNHCR was disturbed to learn that three boats had already attempted the crossing in 2012, with one going missing at sea. On that note, she also welcomed the efforts of the Italian, Maltese and Libyan authorities to rescue distressed boats in the Mediterranean. “We renew our call to all shipmasters in the Mediterranean, one of the busiest stretches of water in the world, to remain vigilant and to carry out there duty of rescuing vessels in distress,” Ms. Wilkes stated. Of last year’s arrivals by sea, 56,000 landed in Italy while Malta and Greece received 1,574 and 1,000 respectively. In addition, according to the Greek Government, an estimated 55,000 irregular migrants crossed the Greek-Turkish land border. In one of the deadliest incidents in the Mediterranean Sea so far this year, at least 150 people have drowned and scores of others are missing after a boat leaving Libya capsized off the Tunisian coast on Wednesday, the United Nations refugee agency reported today.